Trattoria Lisina, located in the Texas Hill Country, just rolled out their spring menu featuring Italian classics prepared with the finest ingredients. Small, family owned restaurants pepper the Italian countryside, each offering a unique take on the regional cuisine. Recipes unchanged for generations, wine flowing freely- these casual, rustic eateries are filled with energy, alive with the sounds of friends and family- sharing food and becoming more animated as the night and the wine progress. These restaurants truly represent the soul of Italy. A sincere love of family, friends, food and wine are the hallmarks of the trattoria. Damian & Trina Mandola bring these ideals to the Texas Hill Country with Trattoria Lisina. We invite you to join us in Driftwood for a taste of Italy right in your own backyard. Sit back, relax, enjoy. 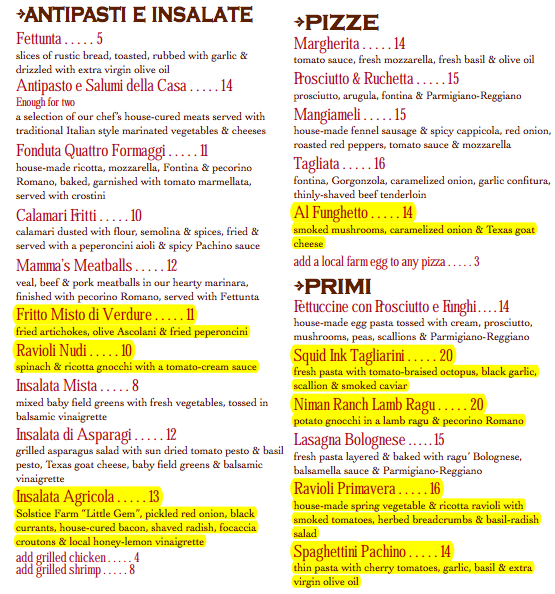 Items highlighted in yellow are new to the menu.